Anna J. Henderson Simmons. | Scuffalong: Genealogy. Anna J. Henderson Simmons. – Scuffalong: Genealogy. Something brings me back to Anna J. Henderson Simmons. At no more than 20 years old, she left all the family she knew to follow her new husband 800 miles to Canada, where his Wayne County family had settled decades earlier. It is hard to get a sense of Anna’s life. Her husband Montreville Simmons achieved a measure of success as a farmer in central Indiana, but evidence suggests that he was a difficult man to live with. Did she ever see her birth family again? Probably not, and evidence suggests that her children had an uncertain grasp on the facts of her early years. In the 1860 census of Westbrooks, Sampson County, North Carolina, appear James Henderson, mulatto carpenter; wife Eliza; and four children, Anna J., Susan, Hepsie, and Alexander. Eliza (or Louisa) Armwood, daughter of John and Susan Armwood, was James’ second wife. 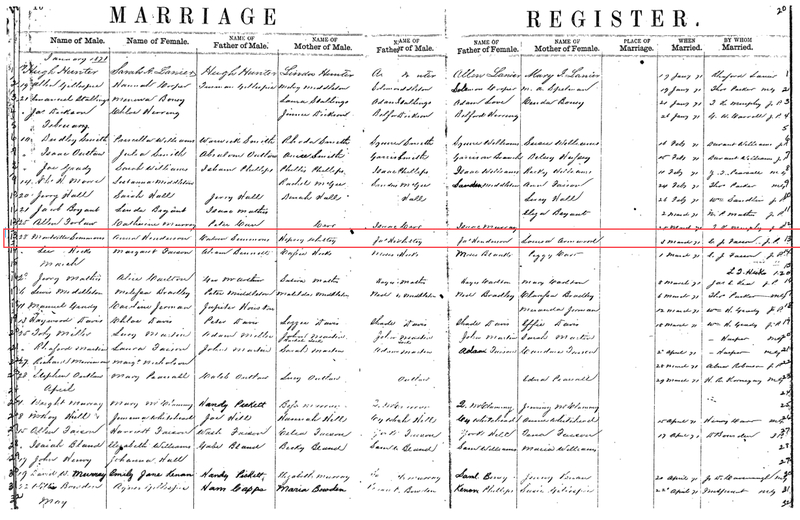 Duplin County, North Carolina, Marriage Register. Montraville Simmons was a successful farmer, but a life of material (if heavily mortgaged) comfort did not necessarily spell ease for Anna. Montraville’s name peppered the local paper regularly, as Pharos-Tribune reporters gleefully chronicled his clashes with neighbors and his personal peccadilloes. Anna herself managed to stay out of print until 1905, when the ailing woman parachuted into a spat between her husband and his creditors. Headlines blared her surprising intervention, and it’s hard not to see Montraville’s hand as a puppet master in this 11th hour shenanigan. 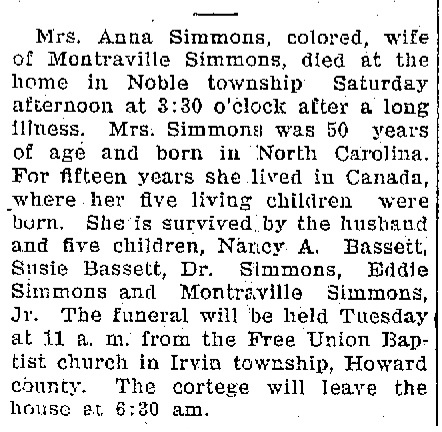 Logansport Pharos Tribune, 22 December 1905.
Who were Anna Henderson Simmons’ legacies? Is there a lost branch of Hendersons in middle Indiana? Elizabeth Simmons (circa 1872-??) probably died before adulthood. Or she is the same person as Moncy Simmons. Moncy A. Simmons (1872-1942) married first Daniel Bassett, then Newton Palmer; no known children. Doctor R. Simmons (27 November 1874-after 1951) married Fannie Gibson; no children. Susan M. Simmons (circa 1877-1937) married Britton Bassett; two children, who died in infancy. She helped rear her brother Montraville’s son Harold. James R. Simmons (circa 1879-aft. 1900) probably did in young adulthood; no children. Or, he is the same person as Edward Simmons. Montraville Simmons Jr. (circa 1880-31 March 1910) married Jessie Winslow in 1903. His son Harold Simmons was born about 1904. On 7 October 1911, Jessie gave birth to Helen Elizabeth Simmons in Chicago and listed Montraville on Helen’s birth certificate, but he could not have been the child’s father. Similarly, in the 1920 census, Jessie Winslow Simmons, remarried to Earnest W. Griggs, attributes by inference two additional children to Montraville Jr., Frances (born 1913) and Alma (born 1916). Neither were his. Harold is mentioned in his aunt Moncy’s obituary, but does not regularly appear in census records. Edward Simmons (24 November 1883-1936) married only after his parents’ deaths, but married four times in 20 years. He had no children. In other words, improbable as it seems, Anna’s seven children produced a single grandchild, and he seems not to have any children. There are not, it seems, any Kokomo cousins. Pingback: At rest in Indiana. | Scuffalong: Genealogy. Pingback: James Henderson’s children, part 2: Eliza Armwood. | Scuffalong: Genealogy. Pingback: Citizenship. | Scuffalong: Genealogy.